Targeted to a family audience, Mentors features two fifteen-year-old techno wizards, Oliver and Dee. Oliver has invented VISICRON and his friend Dee has an IMAGISCREEN, a holographic display system. Each week the teens, using their ingenious computer program, transport famous figures into the present to help them find a way to solve a problem. Along the way, the mentors reveal surprising, little known facts about themselves, adding new hues to their already colorful lives. Scientists, artists, politicians, soldiers, philosophers, athletes -the entire gamut of recorded history is our palette as the kids discover facts not found in textbooks about these remarkable people -bringing history to life in an entertaining format. 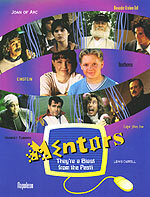 Mentors include Albert Einstein (Elliot Gould), Lewis Carroll (Thomas Cavanagh), Ludwig van Beethoven (Henry Czerny), Queen Elizabeth I (Margot Kidder), Arthur Conan Doyle (William B. Davis), Moses (Jan Rubes), Casanova (Tony Rosato), Black Bart (Cameron Daddo), and Nostradamus (Kim Coates) among others. Mentors stars Chad Krowchuk (Bye Bye Blues, Jake and the Kid) as Oliver Cates, Sara Lind (Edgemont Road, Honey I Shrunk the Kids) as Dee Sampson, Belinda Metz (So Weird) as Oliver’s Mother Anne, and Shaun Johnston (Traders) as Oliver’s father Roy. In Season 2, Oliver’s cousins Simon and Crystal are introduced, played by Stevie Mitchell and Samantha Kreutzfeldt. Mentors was created and produced by Josh Miller. Margaret Mardirossian of Anaid Productions is Producer and Kevin DeWalt is Executive Producer. Shot on location in Edmonton, Alberta, Mentors is broadcast to over 50 countries around the world.